Don’t ignore the headwinds facing this newly merged chipmaker. In early February, Avago Technologies merged with fellow chipmaker Broadcom Corporation to become Broadcom Limited (NASDAQ:AVGO). The combined company now sells a broad portfolio of analog and mixed signal chips, wireless radios, custom networking chips, and data center networking chips for a wide range of industries. The new Broadcom has plenty of strengths -- economies of scale to boost margins, robust wireless and enterprise growth, and expansion opportunities in server chips. However, the company also faces three major headwinds which investors shouldn't overlook. Avago and Broadcom were both major Apple (NASDAQ:AAPL) suppliers. Apple orders accounted "more than 10%" of Avago's sales over the past few quarters and 14% of Broadcom's 2014 revenue. In the iPhone 6s, Avago supplies the power amplifier modules, while Broadcom provides the touchscreen controller. Avago provides similar parts for iPads, while Broadcom supplies combo-radios for the tablets. Apple's report that iPhone shipments only rose 0.4% annually during its first quarter dragged down many of its top suppliers, including Avago. But whereas some other major suppliers are diversifying into new markets to reduce their dependence on Apple, the "new" Broadcom will be just as exposed to the tech giant as Avago or Broadcom. The merger could expand Broadcom's margins by lowering production costs and boosting its clout in price negotiations, but it could also backfire if Apple's iPhone sales peak this year and iPad sales keep declining. During the fourth quarter, Avago's "industrial and other" revenue fell 7% annually and accounted for 8% of its top line. Avago blamed that decline on weak demand in the Americas and Japan, which wasn't fully offset by stronger sales in Asia and Europe. It also reduced shipments due to macro challenges facing industrial customers worldwide. Simply put, deeper economic slowdowns worldwide will throttle demand for Avago's industrial chips. Avago's industrial numbers don't compare well against Texas Instruments' (NASDAQ:TXN), which reported that its industrial sales were "about even for the year" during last quarter's conference call (as transcribed by Thomson Reuters). TI VP Dave Pahl noted that the company's diversification across 14 different industrial sectors enabled it to offset losses in some segments with gains in others. Therefore, investors should see if Avago's merger with Broadcom diversifies the company's industrial portfolio in the same way to minimize macro threats. Avago's $37 billion merger with Broadcom was funded by $17 billion in cash and $20 billion in stock. To raise that cash, Avago took on $9 billion in new debt, giving the combined company $14.2 billion in debt and a leverage of about 2.5 times EBITDA. During last quarter's conference call, Avago CFO Tony Maslowski claimed that the company's leverage could safely go "slightly above" 3 based on its current cash flows. 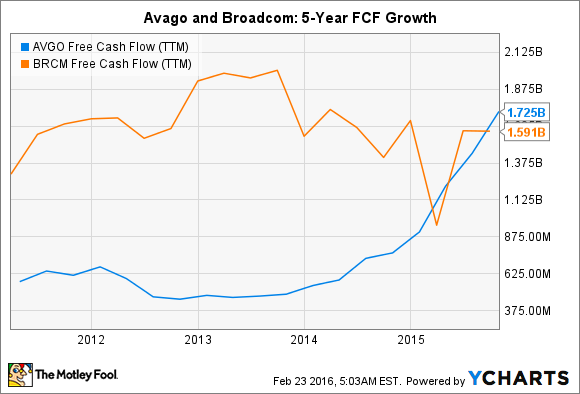 Over the past 12 months, Avago and Broadcom generated a combined $3.3 billion in free cash flow. The two companies spent $734 million of that total on dividends and $366 million on buybacks, which leaves it with significant room to pay off debt with its FCF. Avago said that the merger would be "immediately accretive" to its non-GAAP EPS and free cash flow, and that it would generate $750 million in annual cost synergies over the next 18 months. Avago didn't say much about how the big merger would impact buybacks or dividends, but it warned during last quarter's conference call that its dividend program could be affected by "financial performance and condition, the contractual provisions related to our outstanding indebtedness, and other factors." In other words, if Avago has trouble digesting Broadcom and its FCF growth slows, a suspension of dividend hikes or buybacks might discourage investors from buying more shares. Although investors should take note of Broadcom's exposure to Apple, its industrial weakness, and its elevated debt levels, they shouldn't overlook its valuation. Broadcom shares currently only trade with a 5-year PEG ratio of 0.75. Since a PEG ratio under 1 is considered "cheap", Broadcom shares are undervalued relative to its projected annual earnings growth rate of 17% for the next five years. This indicates that Wall Street believes that Avago's merger with Broadcom will pay off in the long run. Looking ahead, investors should pay attention to Broadcom Limited's first quarter earnings report on March 3 for more details.